Polyclonal antibodies are produced by inoculation of a suitable mammal, such as a mouse, rabbit, sheep or goat with special designed antigen (purified protein, synthetic peptides, organic compounds or viral particles), which it induces the B-lymphocytes to produce IgG immunoglobulins specific targeting the antigen. This polyclonal IgG is purified from the mammal’s serum. They can be used as both primary and secondary antibodies in Westerns blot, ELISAs, IHCs and other quantitative immune detections. With AAALAC International accredited animal facility, CHI Scientific provides polyclonal antibody services in mouse, rat, rabbit, chicken, goat/sheep, SPF animals, and other species. 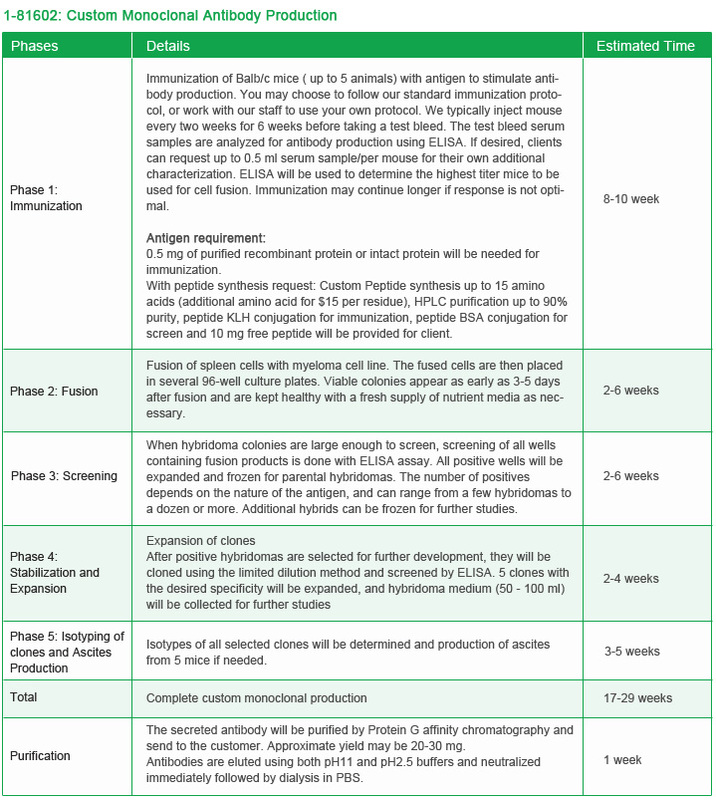 Our polyclonal antibody service package includes antigen design, peptide synthesis, immunization, purification, ELISA test, and lyophilization. Customers can simply select their desired packages and send us their specific requirements, and CHI Scientific will offer antibodies with guaranteed quality of specificity. • Final Deliveries: 3-5 mg purified antibody or desired volume of anti-sera.